Want to know a red hot strategy to grow your business? That means delivering the best possible customer experience to actively retain your customers. This is the new growth area, because 80% of your company’s future revenue will come from just 20% of your existing customers, according to Gartner Inc. Implementing a customer retention strategy will give you an early advantage over your competitors. That’s because a whopping 80% of businesses think they’re delivering a superior service, yet only 8% of their customers agree with them. And what about the bottom line? A study by Bain & Company found those businesses that increased their customer retention rates by as little as 5% typically saw profit increases ranging from 25% to 95%. Customer retention is a key brand differentiator and one of the most important components of positioning. An existing customer has already gone through the know, like and trust phase with you. They’ve purchased your product or service and they trust you. They believe your product is better than what your competitors offer. The positioning of your product has resonated with them and they’ve purchased. And this makes it easy when they purchase from you again. 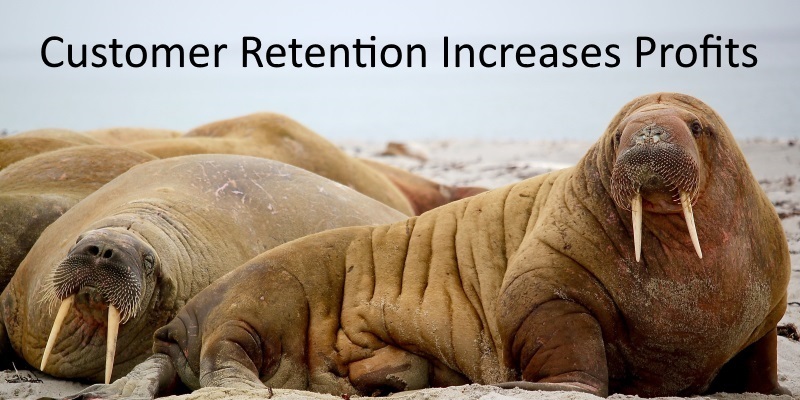 The stats for embracing a robust customer retention strategy are compelling. According to Marketing Metrics, there’s only a 5-20% chance of selling to a new customer compared to a 60-70% probability of selling to an existing customer. That means you’re 14 times more likely to sell to an existing customer than a new customer. Then there’s the 6-7 times cost of attracting and converting a potential customer into a paying customer, as stated in a report by John A. Goodman for the White House Office of Consumer Affairs. That’s significant and makes it a no brainer to do everything possible to retain your customers. Retaining your customer involves actively delivering the best possible customer experience. Selling to an existing customer is easier than selling to a customer that hasn’t purchased from you. It’s far more profitable than converting a lead or a prospect as outlined above. An existing customer is highly likely to buy from you again. They talk. They’ll recommend your product or service to their friends. That can be face to face, social media or whatever, it doesn’t matter. According to American Express, one happy customer will tell nine other people about their experience. You can charge more by delivering a superior customer experience. A study by RightNow Technologies found that 86% of consumers are willing to pay up to 25% more for a better customer experience. Then there’s the lifetime value of the customer. On average, loyal customers are worth up to 10 times as much as their first purchase. Customers expect a lot. A recent report shows that 60% of consumers have higher expectations for customer service than they did just one year ago. Yet the majority of businesses are not delivering that superior customer experience, even though consumers are willing to pay more for your product to obtain it. That’s what your customers want. Your profits are increased substantially. It’s a key brand differentiator where customer experience will overtake price. For it to be successful, a customer retention strategy needs to be adopted at all touch points with the consumer. And it has to be consistently superior. Customer retention shouldn’t be just a cog in the wheel of marketing. It should be front and center. Mark Crosling is an entrepreneur, content marketer, and copywriter. He's a creator of online media assets that include podcasts, online courses, and mentors young entrepreneurs and start-ups. Very true, this happen over and over again to my own business. It’s way easier to sell to my customers than selling to new ones. Takeaway: keep producing quality products, treat our customers well and it’s always win-win. Thanks for the nice article, Mark. Good customer service and hence retention can be really simple – how you want to be treated is how your customer wants to be treated, and that’s a win-win. Thanks so much for dropping by Verena. For add-app I see the same with our customers. It’s hard to build new sustaining relationships! Also for “and3rs in training”. I am more than busy with only 3 customers within Pharma. Thank you, Mark – an excellent article on a simple subject that so many ‘high powered executives’ simply overlook. I’m appalled by the number of so-called client/customer-focused organisations that simply cannot grasp this simple concept! The major problem is customer service is viewed as a cost by most organizations. Thanks for your insights Michael.